How About Driving A Brand New 1968 Mini Van? 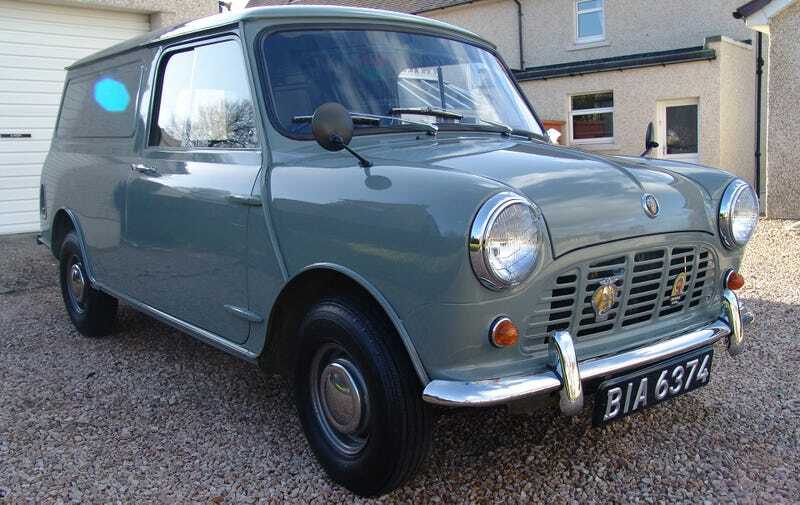 This cute workhorse has 302 miles on the clock and the seat protectors and rubber floor mats left right where the British Motor Corporation put them back in 1968. Also, Dunlop cross-ply tires! You know how much I love the idea of buying old cars brand new. First registered on the 14/03/1968, the van was bought new by a Miss G. Crumcott from Northern Ireland for the mere sum of £400 so that she could learn to drive. She never managed to pass her driving test and this brand new Mini van lay unused, locked away in her shed for nearly three decades. It was discovered in this same shed covered in old copies of the Ballymena Observer and could not have been preserved in better condition. It was eventually purchased by a local BMC Mini dealer and enthusiast Mr T. Turkington in 1997 and placed in the Mini Centres showroom until 2006. The van was then purchased by a car collector from Northamptonshire and has recently been brought back onto the classic car market. It seems like nobody wants to drive the poor thing. Would you change that, or keep it in your living room instead? If you think about it, it's also perfect for your fridge magnet collection! Look at it! It's mint!